Pictured with optional weight stack guards. The BodyCraft Galena Pro is built to fit into any corner of a room, requiring much less space than traditional designs. 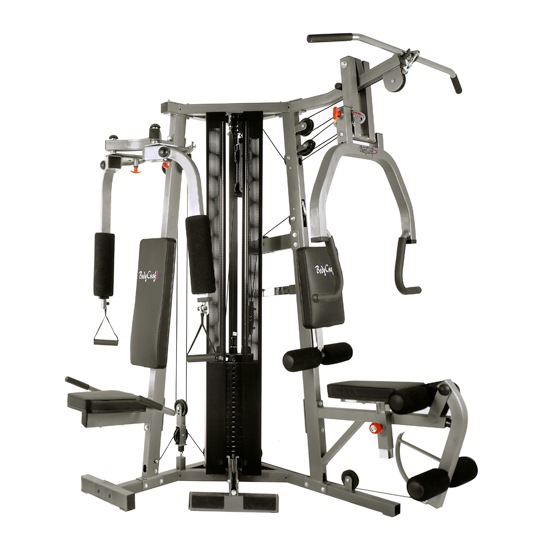 Featuring a Chest Press, Dual-Function Pec Dec, Leg Extension, Leg Curl, Lat Pull, Low Pulley Station, Abdominal Crunch, and Leg Press (optional; please click on the accessories tab above for more info), allowing every major muscle group to be strengthened in a minimum amount of time. 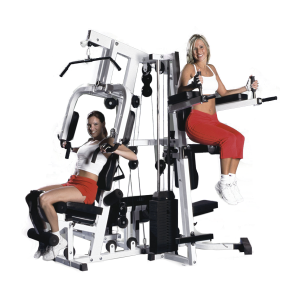 No other gym is more complete and offers greater quality and value than the BodyCraft Galena! • Rugged – Built to last a lifetime! 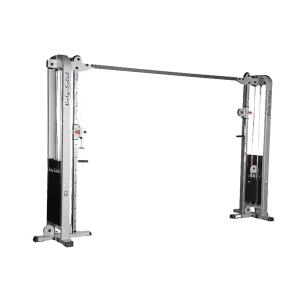 The BodyCraft Galena Strength Training System is made using heavy 2” X 3” and 2” X 2” steel tubing, 7 X 19 strand 2000lb. tensile strength aircraft cable, and fiberglass reinforced nylon pulleys with sealed bearings. 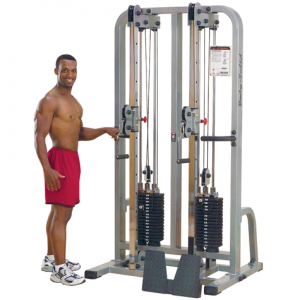 • Dual Function Pec Deck – The only Pec Dec made that provides traditional flys and dumbbell style flys. Traditional flys are performed by pressing elbows against the pads. Dumbbell style flys are performed by simply grabbing the handles and swinging outward to chest height and then pressing forward and together. Range-of-motion adjustments fit every size user and also provide for rear deltoid flys. The most versatile Pec Dec made! • Adjustable & Comfortable – Seat and seat back are fully adjustable. The high density foam is contoured for lumbar support and covered by heavy gauge vinyl. 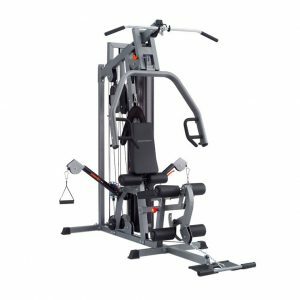 • Low Pulley Station – Easy to access and plenty of room for exercises such as leg kicks, arm curls, low rows, deltoid raises, and more. 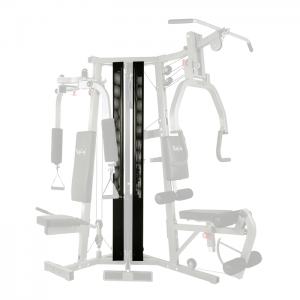 • Adjustable Starting Point For Bench Press – This allows for different size users and also provides a variety of exercises including Bench Press, Incline Press, Shoulder Press and Mid Row. Seat and seat back are adjustable. • Lifetime Warranty – Since it is built to last a lifetime, every part of the BodyCraft Galena is guaranteed for as long as you own it. We will replace or repair any defect. Warranty applies only to the original owner and for in-home use. • Dimensions – 58” Wide (Pec Dec) X 72” Deep (Press Station) 92” Wide with Optional Leg Press (see accessories tab above) X 81” High. • Made using heavy 2” X 3” and 2” X 2” steel tubing, 7 X 19 strand 2000lb. tensile strength aircraft cable, and fiberglass reinforced nylon pulleys with sealed bearings. • The only Pec Dec made that provides traditional flys and dumbbell style flys. Range-of-motion adjustments fit every size user and also provide for rear deltoid flys. 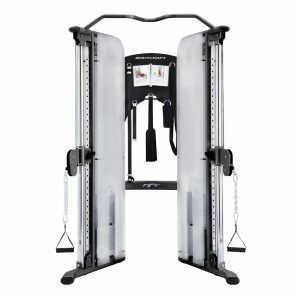 The most versatile Pec Dec made! • Seat and seat back are fully adjustable. 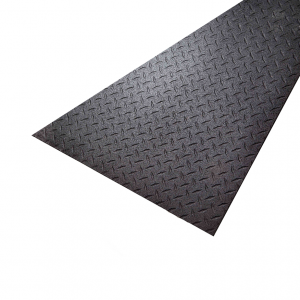 The high density foam is contoured for lumbar support and covered by heavy gauge vinyl. 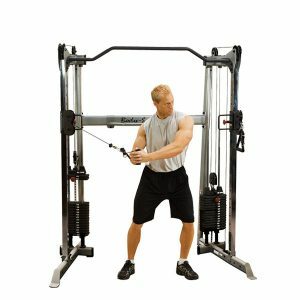 • Low pulley station is easy to access and allows plenty of room for exercises such as leg kicks, arm curls, low rows, deltoid raises, and more. 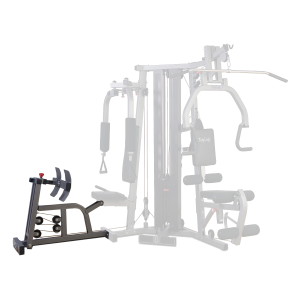 • Bench press station with adjustable starting point allows for different size users and also provides a variety of exercises including Bench Press, Incline Press, Shoulder Press and Mid Row. Seat and seat back are adjustable. 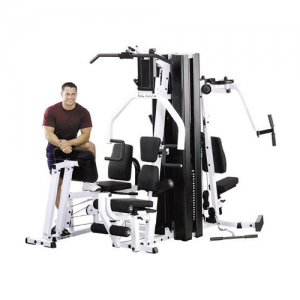 • 58” W (Pec Dec) X 72” Deep (Press Station) 92” W with Optional Leg Press (see accessories tab above) X 81” H.
• Since it is built to last a lifetime, every part of the BodyCraft Galena is guaranteed for as long as you own it. We will replace or repair any defect. Warranty applies only to the original owner and for in-home use.